How are runner bodies shimmed? I've heard talk of using a spare chock to align all runners the same by shimming. I've built a laser runner edge sight, and have a pair of laser levels for chock alignment, but I'm not sure about what shims are constructed of, etc. I am of the bonded-runner ilk. Go to the DN Main website (www.idniyra.org) and go to the articles link, and print the Jan Gougeon article about chocks and blades. That is the source for my strategy of using a master chock and getting all my runners to align in that chock so any two are interchangable. I clamp a chock on a sturdy bench and sight on a plumb line against the far wall. I check both edge-wander and alignment. Sliding fore and aft shows where you ground the runner edge othr than straight. In the past I used a 22 rifle telescope. I never thought alignment of the sight was too critical until a discussion on the DN board last year convinced me it was. I thought I was in pretty good shape with edge straightness, but now can see the slight arc I put in some of my runners using the gun sight offset about two degrees. At the Geneva swap meet, Paul demonstrated the use of a laser level (Black&Decker from Lowe's for $35). The unit is about the size of a tape measure, and is driven by a 9V battery. My wife thinks I bought it to put up chair rail. I may have to do that. Two notches are put in the base and it projects a red line on the wall to check with my plumb line. Way more better. Again, geting the notches right is important. I sight the runner edge to my target, then put one notch in the level, moved the line to line up, then marked and filed the second notch. I've heard of using ultra-thin fiberglass (3 oz. from a hobby shop) stiffened and bonded onto the runner with "Super-Glue". I've never tried that, but it sounds like a good way to go (and I'm planning to give it a shot on the next set of runners I need to shim). You can fine-tune the fit by sanding off a small amount of the shim material, if needed. I believe some folks make their runners a bit thick (0.010"-0.020") and then wet-sand the body to fit into the chock perfectly aligned. What I've personally used is a self-stick Teflon tape that is 0.005" thick. It's a bit on the thick side for really fine tuning, but I was able to get my runners pretty close with it (and I had a roll of it hanging on the wall...). 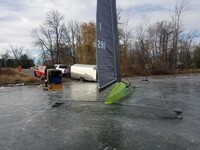 Our club in Traverse City (GTIYC) sets the super glue with a kicker, or instant hardener. Works great! I'll have to get to a hobby store this weekend and stock up. Scott C - DN:"Wet Paint"
Teflon shim tape compresses so is not recommended for use as shim tape. The "best" is thin sheets of fibrglass. The stuff is sold for fabricting printed circuit boards. I have not seen it, but Couch (John Davenport) had sheets in several thicknesses. It is durable, wears well and can be glued with either superglue or a drop of epoxy. I have been using UHMW stick-backed tape. There are several sources. I bought 50 feet of 0.010 and 0.003 in 1 inch widths from a shop in IL I found through an internet search. They sell a variety of thicknesses and cut to order. The runners need to be a fraction under to use it. I have several runners I've sanded to fit, and like that better. Others use epoxy to fill to fit, shich I have not been confident enougth to try. Any hints on this technique?